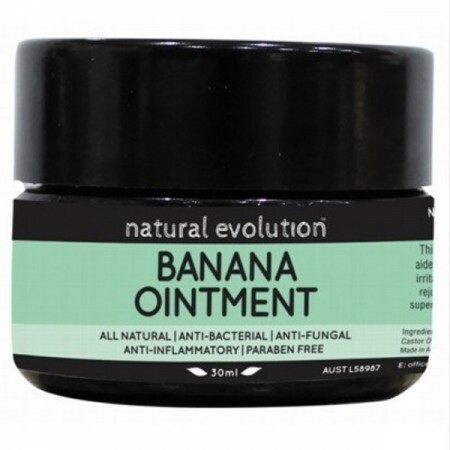 Natural ointment made using the super rich antioxidant properties of Australian green Cavendish bananas. Use on people and animals to aide in healing arthritic pains, burns, cuts, skin abrasions, rashes, irritations, nappy rash and cold sores. 30ml. Green banana products reduce unsaleable food waste from banana plantations. Read more below about this great story of ingenuity. Natural Evolution Foods is the winner of the 2016 Premiers Sustainability Award for Innovation in Sustainable Technologies - your purchase supports Australian farmers. Can be used on humans and animals. Rub onto tired aching muscles to soothe arthritis or muscle pain. Dab onto affected areas to soothe and treat acne and skin blemishes. Apply daily to treat warts and sun spots. 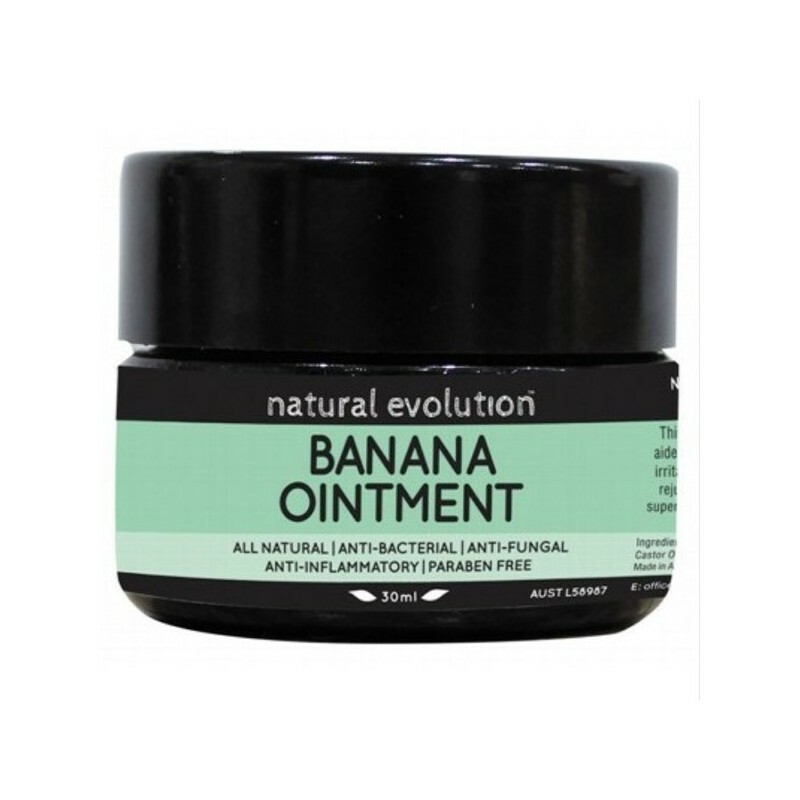 Use a small amount applied directly onto the skin as a gentle topical treatment for minor burns, cuts, abrasions, rashes, cold sores or insect bites. 30ml / De Musa Antioxidant Extract, Ricinus Communis Seed Oil, Hydrogenated Caster Oil, Beeswax, Copernicia Cerifera Wax, 0.1g Potassium Sorbate. Are you aghast at the food wasted because of grocery retailer's ridiclous "cosmetic food guidelines" such as the length of shape of bananas? So was North Queensland banana farmer, Rob Watkins. Week after week Rob's farm disposed of tonnes of beautiful Lady Fingers that they had poured so much energy and resources into growing just because they were too big, too straight or too bendy for the supermarket giants. The fruit was perfectly good for eating and packed full of nutrients. Every week the local wallabies would flock to east as many green Lady Fingers as their tummies could handle, along with cattle breaking fences to get to the wasted* green bananas (*wasted meaning unsuitable for supermarket guidlines). After suffering mild coeliac symptoms for years Rob knew of the need for good quality gluten free flour and he began producing flour from the wasted bananas. According to Rob, his family and dogs constantly suffered “hot spots” a bacterial infection related to staph that is present in soils in tropical weather. Fed up with antibiotics and cortisone creams, they turned to natural remedies. It was in the thermomix that their first batch of ointment was made. After first trialing it on themselves Rob and Krista waited for the dreded infection to return. In one application the “hot spot” infection stopped spreading, cleared and ceased to weep, new healthy skin could be seen reforming with new hair beginning to grow. The infection healed more than 10 times faster. From here the ointment was used on the farm for first aide burns, cuts, skin rashes. Great for cuts and scrapes, smells great to! I bought this ointment to replace an acne cream my son and I were using. I still get hormonal breakouts and nothing really seems to work. I have been using this for a bit more than a week now and the acne cluster on my jawline has completely dissapeared! I out it on after the shower at night and when I wake up my skin feels so soft. My skin is looking so much smoother, and my son's teen acne is starting to be less severe also. He hates putting things on his face, but he loves this. It blends in once you rub it into the skin and it smells nice too. I thought it was vegan, my fault for not checking more carefully. I really liked the idea of this, but it contains beeswax. I shall pass it on to someone who doesn't mind. Such a shame.